Classic Bollywood film poster for sale of the blockbuster Hindi film Khal Nayak (1993). This is an actual surviving classic Bollywood movie poster for sale of the 1993 action Hindi film that was produced and directed by Subhash Ghai. Khal Nayak is a record breaking blockbuster film that starred Sanjay Dutt, Jackie Shroff and Madhuri Dixit in lead roles. Songs from the film, particularly “Nayak Nahi Khalnayak Hoon Main” and “Choli Ke Peeche Kya Hai” attained cult status upon the film’s release and are played till today. Khal Nayak sold ten million cassettes during the very first release of its soundtrack album. Khal Nayak was ranked in the top 100 films of world cinema by film magazine Sight and Sound in its January 2000 issue, making this classic Bollywood poster highly collectible! This classic Bollywood poster was designed and printed for publicity of the film during its original first release somewhere in the early 1990s but never ended up being used. The design of this Khal Nayak movie poster uses an interesting technique of still photographic collage. 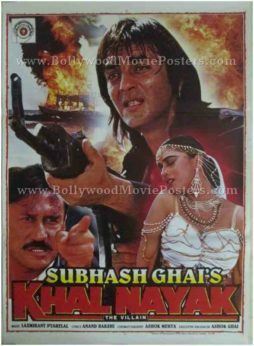 Sanjay Dutt is seen prominently in this Khal Nayak movie poster holding an automatic rifle. Smaller still photographs of Jackie Shroff and Madhuri Dixit are seen at the bottom of this Khal Nayak movie poster. The entire poster is set against a fiery background. Khal Nayak is remembered mainly for the legal and political controversy created by its cult song, “Choli Ke Peeche Kya Hai.” During the shooting of the film, actor Sanjay Dutt (who played the title role in the film) was arrested for illegal possession of firearms, creating further complications for the film’s release.